Managing a retail store is a tough job. There are several tasks that are assigned to you when it comes to managing the retail store, for example, managing the inventory, keeping track of the sold goods and a lot more. A resignation is required to be written by the retail manager when s/he wants to leave the current job for any reason. It is not necessary to mention the reason for leaving the job in the letter. Don’t ever try to tell your employer how much you hate this job. If the employer is much concerned to know the reason for leaving the job, tell him in person instead of mentioning in a resignation letter. It is always advised that you should express the gratitude in your resignation letter. Even if you have some differences with your employer, it is recommended to thank him for providing you the opportunities to work and gain experience. The resignation letter is complex yet an easy task if you know how to draft it effectively. The first thing to remember is to keep the tone of the letter completely professional and calm. The two main characteristics of a perfect resignation letter are simplicity and clarity. Make sure that the details included in the letter were very important to mention. The date on which you will quit the job should be mentioned in the resignation letter. 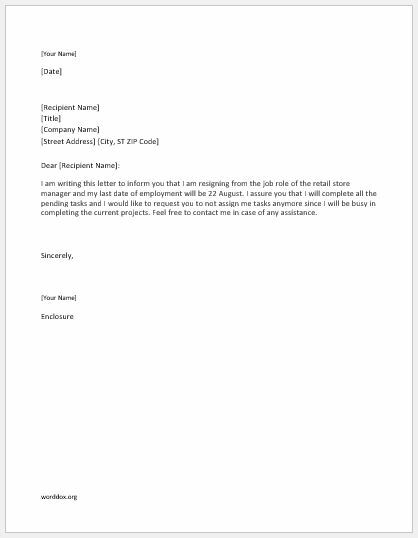 Here is a sample retail story manager resignation letter, that can help you know about the format and structure to be adopted. I am writing this letter to inform you that I am resigning from the job role of the retail store manager and my last date of employment will be 22 August. I assure you that I will complete all the pending tasks and I would like to request you to not assign me tasks anymore since I will be busy in completing the current projects. Feel free to contact me in case of any assistance.